Given that this spans essentially eight decades — let’s call it five or six, since there aren’t many octogenarians hanging around the water cooler trading theories about Big Little Lies — the result can be any number of communication issues. That’s why government agencies, nonprofits, and companies like Harley-Davidson hire Tracey Sturgal, a professor in communication studies at Marquette University. Sturgal holds intergenerational trainings to teach employees born in different decades how to interact with one other. 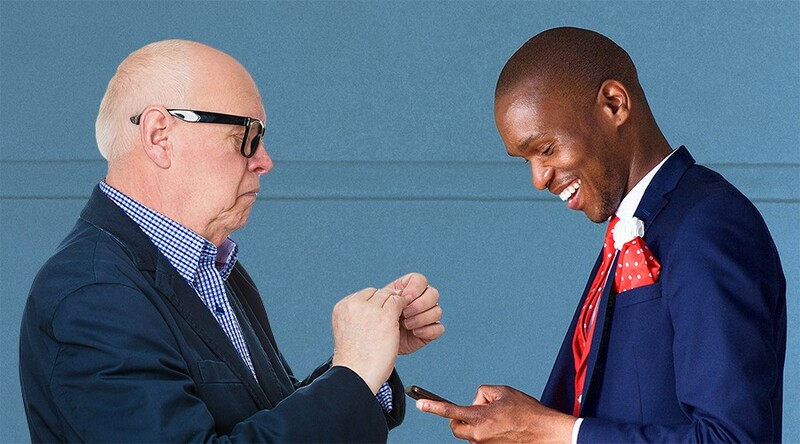 For good reason, too: The most common disconnect in the workplace, Sturgal explains, is between millennials and their boomer / Gen X managers. I recently spoke with Sturgal about ageism, why intergenerational communication is more difficult than ever before, and all the different stereotypes that plague millennials. Has there always been tension around different generations converging at the office, or is there something unique about millennials that’s pushed it to the forefront? Millennials are the largest generation and make up the bulk of the workforce. Companies realize it’s much more cost-effective to keep the employees they have happy. Gen X wasn’t a large enough generation to be as effective at asking for positive changes in the workplace—partly because they initially didn’t have the global network to know that many were asking for the same things. People have always struggled to conform to the culture of a company — not just millennials. They were, however, the first collective generation to be able to take advantage of asking for major change in the workplace. For example, Gen X started the push to work remotely, but millennials made the final successful push to make it as common as it is today. It also involved managers learning to trust that younger employees could get their work done without being under the constant eye of their supervisor. But if it’s always been a struggle for new generations to assimilate at the office, why have there been so many books written on millennials in the workplace? You can do it in two ways: With internal attributions or external attributions. Internal attributions would be personalities, motives, beliefs, etc. The external is when we assign the cause of the behavior to a situation or event that’s outside of the person’s control. As you can imagine, we like to attribute our own behavior to external attributions and internal attributions to other people. We don’t want to have to say “this is my hangup” or “I’m lazy” so we put it on other things. 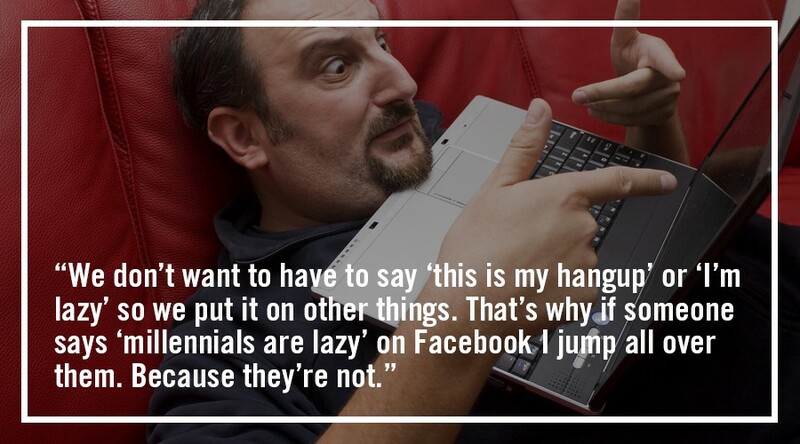 That’s why if someone says “millennials are lazy” on Facebook I jump all over them. Because they’re not. I work at a university and teach millennials. Have I had some individuals who were lazy? Sure. I’d wager you can say that about some students from every generation. However, I’ve had an overwhelming amount of students — and I teach 350 to 400 students each semester — who are hardworking and focused. And I’ve watched many of them go on to start successful companies or work tirelessly for the greater good of whatever organization is lucky enough to hire them after graduation. So when I go into businesses to do intergenerational communication training, I always ask management, “How many of your millennial employees are lazy?” The answer is always none. I’ll get answers about how millennial expectations might be different than when the managers started in the workplace, but not that their millennial employees are lazy. We then talk about how much of that is erroneous expectations versus a shift in expectations based on societal change. Is email etiquette still a factor for intergenerational communication?Yes, which is why establishing email protocol and grammar is one my first action steps. I tell people not to write anything in an email they wouldn’t be comfortable saying to someone face-to-face. If it’s a difficult email to write, that’s usually a sign that you should be having an in-person conversation instead. How do you encourage this in a Slack-based office environment, where tools evolve to cut down on how much face-to-face communication is necessary? Slack and other such tools definitely have their place. They’re meant for efficiency and/or electronic paper trails. But face-to-face communication isn’t going to disappear anytime soon. So it’s important to practice. It seems that ageism in the workplace is more severe than before because of an ever-growing emphasis on youth. How do you manage communication in such a hostile environment? I’m not sure if ageism is more severe or if it’s just more acknowledged and reported now. There’s certainly more opportunity for it to happen with many traditionalists still in the workplace. Ageism cuts both ways, though. Part of the, “Millennials are selfish/lazy/insert negative adjective here” storyline is ageism. There’s a sense of, “Who are they to tell someone how this job should change?” attitude. Sometimes, that’s spot-on. Other times, there’s plenty to learn from younger employees. Conversely, it’s easy for some younger people to dismiss what their older co-workers bring to the table. Among the most important is institutional knowledge. What might seem like a novel idea to a young person might have been tried and failed in the past by some older or by someone who has been at the company longer. What are some things you might say to millennials to help them communicate better? I give them the same information I give older generations: Don’t put everyone under the same umbrella. Along the same lines, I also tell them, you need to get to know people. Ultimately with any communication, a couple things are happening: First, every time you open your mouth, you’re making certain decisions about how you hope to be perceived and heard by other people; second, you’re making word choices for that audience — whether it be one person in a casual conversation or 20 people in a staff meeting. The more you know about your audience, the better you’re going to hit that mark. And the more your audience knows about you, the more they’re going to appreciate your choices. That doesn’t necessarily mean they’re going to agree with you. But if you use a vocabulary choice that everyone knows is from your native dialect and you grew up in Chicago, they’re going to say, “Oh, well, he’s from Chicago and that’s why he said that” and move on. Whereas if they don’t know you, they may think, Where’s he coming up with that word? I’ve never heard that before, and it sounds strange. What’s something you tell managers about communicating with their younger employees? It’s important to allow people to self-identify when it comes to generations. People identify with different generations for many reasons. If you were the youngest of six siblings, you might identify older. If you were the oldest, however, it might go the other way. And so, I never argue with people if they tell me they’re in whatever generation, regardless of their birth year. So age shouldn’t be used as a means of figuring out which generation someone belongs to? It’s an important starting point, but it shouldn’t necessarily be the only defining attribution. Another piece of the puzzle is your life stage. If you’re a high school student who wants to identify as more mature, you might want to claim you’re a millennial. If you’re a younger boomer and most of your coworkers are even younger, there might be social capital in identifying as a Gen Xer. It’s important to tease out each variable. The average age when people get married (if they get married at all) has changed and varies within a generation/life stage. If and when someone might start a family now varies greatly. You also have to think about socio-economic differences. Consider the family dynamic, too: Were they raised by a single parent? Are their parents younger or older? Most of all, we need to remember that work has changed over the years. It used to be that when people graduated from high school or college, they often went to work for the same company for the rest of their lives. Just because it’s not like that anymore doesn’t mean millennials should be viewed negatively for jumping from job to job. They’re not the only ones not being loyal to companies, which is the story that some companies push out. The idea that life stages follow the same narrative now as they did for traditionalists has lead to many faulty narratives about subsequent generations — and maybe millennials most of all. How do you anticipate millennials will work with Generation Z, the generation after them? I wish I had an answer to this. I will say that it seems that all generations are getting better at recognizing how dangerous and costly it can be to stereotype and getting better at recognizing the importance of developing communication skills to better understand their colleagues and coworkers. We have to remember that most of Gen Z is being raised by Gen X. I think Gen Z will be commended for their skill in more direct communication. Part of this trait can be attributed to how they are parented. They are also the generation that is working toward greater acceptance of variations across the communication continuums (genderlects, etc). We used to have smaller windows of unmarked areas in communication (where people are not judged for how they are speaking) but each generation helps push the outer boundaries of those unmarked areas. Gen Z will see the biggest improvements by not being judged as harshly or as quickly in a wider variety of communication patterns, and the older generations will benefit as well. One of the complaints Gen Z might need to deal with is what is perceived as an inability to tolerate delayed gratification. Gen Z was raised in an on-demand world. It will be interesting to see how this luxury influences their work habits.